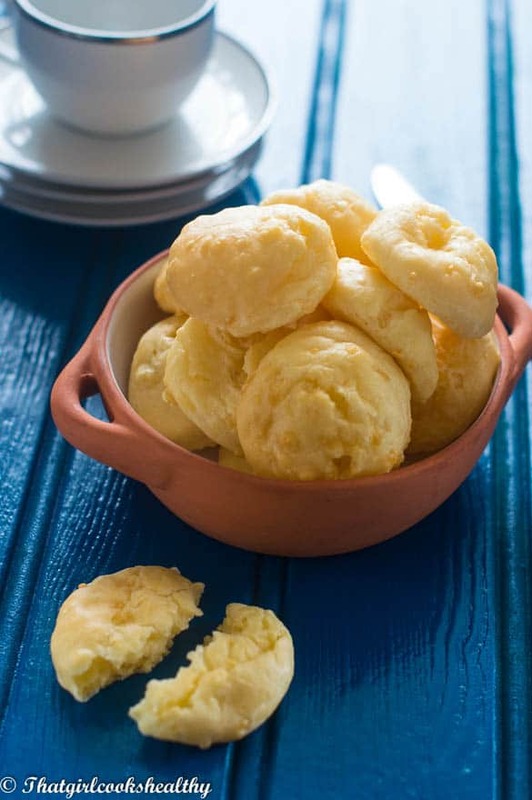 I’m really excisted to share this tasty brazilian cheese bread recipe. Let me tell how I can about making it. A few months a go I was browsing the internet for some new recipe ideas and came across a few interesting Brazilian recipes. 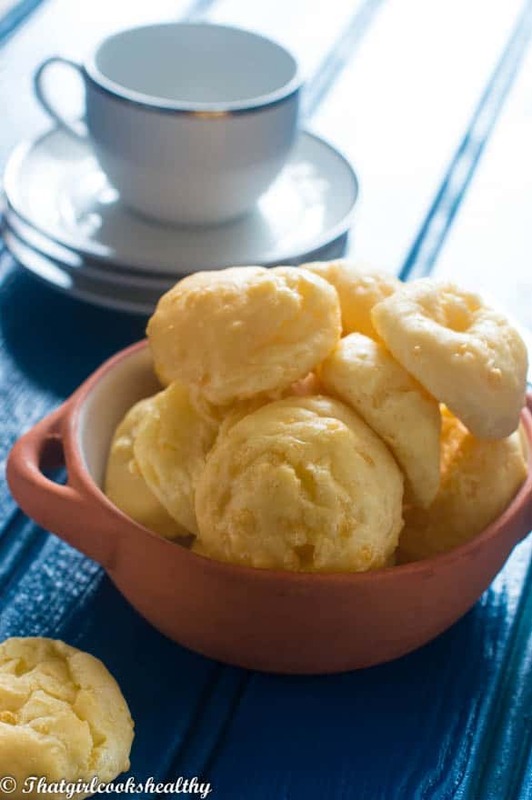 The one that really caught my eye was this Pao de queijo which translates to Brazilian cheese bread. The recipe that I’m sharing was inspired by The Kitchn – This version is by far one of the best that I’ve made so far, the bread is wholesome, the batter consistency isn’t solely of liquid rather more like a pliable dough. Now being dairy and gluten free as you can imagine as I skimmed through the ingredients list I felt despondent when I saw that cheese was a key ingredient. Although I have managed to successfully make my very own homemade version of vegan cheese I already knew before I even tried the recipe that it couldn’t recreate that epic gooey, stretchy cheese shot that was shown in the blog pictures. 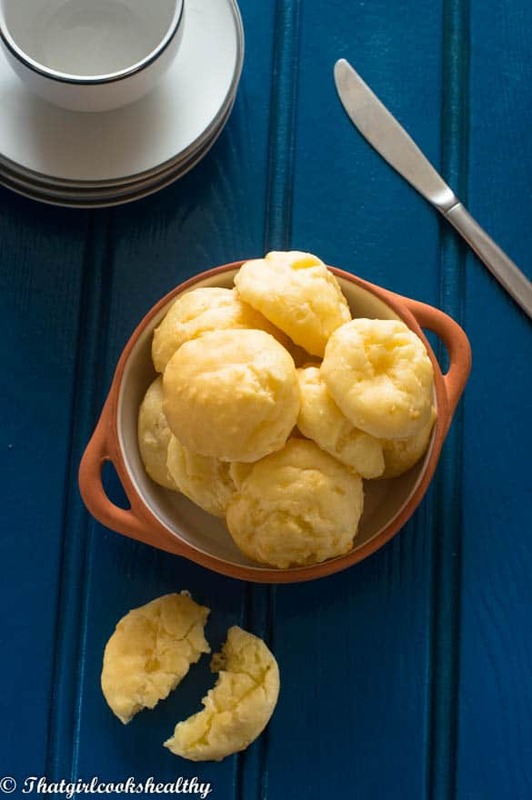 I was determined not be defeated so I began exploring my dairy cheese options in order to make this Brazilian cheese bread recipe. I finally discovered Vio Life’s vegan cheese which not only looks like an authentic block of cheese, it also behaves just like cheese from made from cow’s milk. I was so impressed with the results and taste I just had to finally share the recipe. 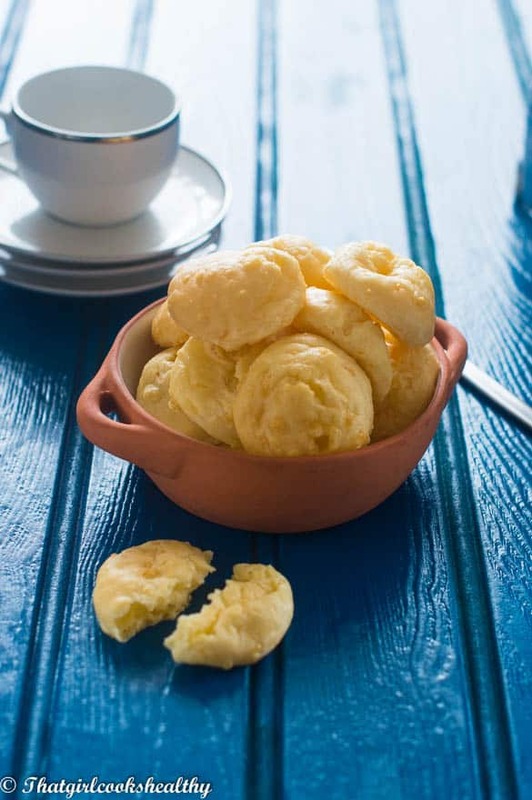 Brazilian cheese bread is also gluten free too!! The good thing about this cheesy bread is that it’s made with tapioca starch which derives from cassava (a tubular root vegetable). Tapioca like other starch is naturally gluten free which is good news for celiacs or the wheat intolerant as there were not flour substitution to be made. I also went one step further by preparing the bread with almond milk and dairy free butter. Again these adjustments had absolutely no bearing on the end result. I even got a few of my non dairy free cohorts to sample the finished product and told them after they had eaten it, that the cheesy bread was free from dairy and they didn’t believe me. That just shows the power of gluten and dairy free appetisers – speaking of which. You can have this Latin bread as a quick snack to nibble on during the day or simply impress your dinner guests with it as an appetiser. 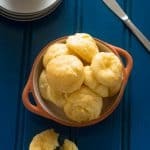 Can Brazilian cheese bread be frozen? Good question! The answer is yes. I would suggest making the dough balls first and then freezing them first before you bake them. Store in an airtight container (preferably in the refrigerator) for up to 3 days. Bring the milk mixed with the coconut oil and butter to a rolling boil then remove the saucepan from the stove and set aside. Proceed to stir in the tapioca starch where a grainy dough will begin to form. On medium speed, slowly pour in the eggs and cheese. Beat the dough until smooth – the dough will form a cross between cookie dough and cake batter. Use a spoon to scoop and apply the mixture onto the baking sheet with 11/2 inches apart. The spoon will be sticky from the batter so dip in water and repeat this step. Place the baking tray in the oven and bake the bread for 12-15 minutes. The finished result should be slightly golden/beige in colour. Leave to cool on rack before serving. Ceil, if bread is your weakness then you will definitely adore this recipe. This recipe looks amazing! I’m a huge fan of cheese bread and am always on the look out for recipes I can try (cause the ones I’ve made so far didn’t really taste that good)..now I’m curious to try your version of it!